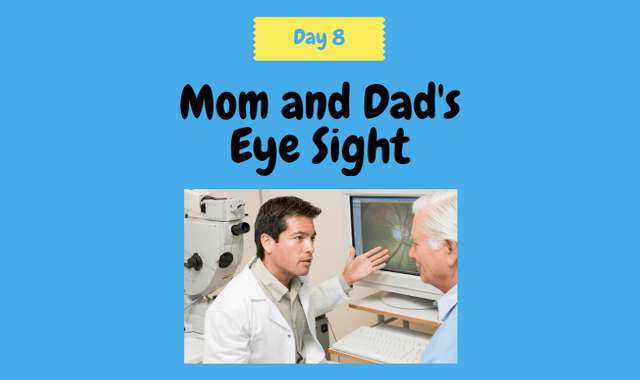 Day 8: Mom & Dad’s and Their Eyesight. Do you know what the number one cause of legal blindness is in older adults? Just take a guess. If you guessed glaucoma, that is not right but don’t feel bad about guessing wrong—you are in the majority of what people usually guess—as in 75% of the people asked do not know this. The right answer is AMD, age related macular degeneration. And it is estimated that about 20 million individuals in the U.S. in the year 2020 will have it. The good news is that some things can be done to help your parents minimize the chance of having poor eye health that can lead to vision loss and blindness. We’ll discuss this topic on Day 8 of the 30 Day Preparation Plan To Care For An Aging Parent. Welcome to the Raising ‘Rents Podcast. This show is sponsored by ComForCare, a national home care provider that will help you live your best life possible. Day 8 of the 30 Day Preparation Plan is the next step in preparing a plan to become a caregiver. Keep in mind as we go throughout this process that our primary goal for family caregiving, regardless of circumstances, is to provide a loved one with a comfortable, caring environment in which to grow old. I wear glasses. I have all my life and as I get older, my prescription gets stronger. So, I get it that as I age, things like eye vision will change. And I feel a little like I have no control over that. But what I never realized is that things like severe vision loss and blindness is something that can happen as we age, but does not necessarily have to happen. There are things we can do to minimize the chance of that happening. Something very important that I learned is age related diseases often do not have symptoms until things get bad. But the good news is that these diseases can be detected early! This is where you come in. The more knowledgeable you are the more helpful you will be. Let’s face it, if ¾ of the people who were surveyed didn’t know the number one cause of blindness in older adults is AMD, one or both of your parents will not know that either. So, there are two types of eye exams. The one you are probably most familiar with is the basic exam where one goes to get their eyes screened for glasses or contact lenses. The other one is much more comprehensive and involves dilating your eyes. The eye doctor can really do a full eye exam when your eyes are dilated and determine how healthy your eyes are. They put drops in your eyes to dilate them, and this allows the eye doctor to examine the backs of your eyes. I said earlier that there are no early symptoms, but an eye doctor can see early signs of eye disease in the back of your eyes and try to treat them if found early enough so it will not lead to vision loss or blindness. We already mentioned AMD, age-related macular degeneration. This is one disease they can be detected early. This disease gradually destroys the macula, the part of the eye that provides sharp, central vision. Although peripheral vision remains unaffected by AMD, the developing “blind spot” in central vision is not something people can see around using natural eye moments. A survey found that 43% of Americans age 65 years or older have or know someone with AMD and find themselves assisting those individuals frequently, despite not being familiar with this debilitating form of blindness. Common risk factors are smoking, obesity, family history, and race, with Caucasians being the most likely affected. We also mentioned glaucoma. This is a group of diseases that can cause fluid and pressure to build up in the eye and damage the optic nerve. Primary open-angle glaucoma (POAG) is the most common form and is a leading cause of blindness in African Americans and Mexican Americans. POAG has no early signs. As it progresses, peripheral vision begins to disappear. Left untreated, POAG can cause blindness. Cataracts can be detected early. It’s a clouding of the lens in the eye and your vision becomes cloudy or blurry. It is most commonly associated with aging, but smoking, prolonged exposure to sunlight, and having diabetes are also risk factors. It can make it difficult to drive at night because of glare from lights. And there is diabetic retinopathy which is a complication of diabetes that damages blood vessels in the retina, the light-sensitive tissue at the back of the eye. Leaky blood vessels cause dark spots to appear in people’s vision. All people with diabetes, both type 1 and 2, are at risk. The longer a person has diabetes, the higher is his or her risk of developing diabetic eye disease. So, if this is true, that these eye diseases can be detected early, then would it not make sense that having your parents visit an eye care professional regularly for a comprehensive dilated eye exam is the most important thing to do to reduce their risk of vision loss as they age. Share this information with them and see if you can get them to go if they are not already going. And it is recommended that if you are over age 50, comprehensive dilated eye exams should be part of your routine health care. It is best to not wait to experience symptoms before you get your eyes examined because vision that is lost often cannot be restored. Eat well. Lots of fruits and vegetables. Dark, leafy greens such as spinach, kale, and collard greens. Also eating fish that are high in omega-3 fatty acids, such as salmon, tuna, and halibut. Be conscious of your weight. Being overweight is associated with the risk for diabetes and diabetes is associated with diabetic retinopathy or glaucoma. Cut out smoking. It’s bad for your eyes and increases your risk for age-related macular degeneration, cataract, and other eye diseases and conditions that can damage the optic nerve. When outside, you should protect your eyes from the sun’s rays. Wear sunglasses that block both UV-A and UV-B radiation and a hat with a brim. There are some warning signs that you as a caregiver can look for with your parents if they have AMD. They may start needing more help with paying bills, running errands, and recognizing friends they meet on the street. As their vision deteriorates, your parent may feel they are losing their independence and it’s very common for someone feeling this to experience increased stress or depression. There are two types of AMD. The more common form of AMD is called dry (atrophic) AMD, which is a slower progressing form of AMD compared to wet (neovascular) AMD, which is caused by abnormal blood vessels that leak fluid or blood and damage the macula. Wet AMD is only diagnosed in 10 percent of all patients. What can a caregiver do for someone who has AMD? As the disease progresses, the aging adult will need more and more assistance to do routine things. As with everything we talk about involving you caring for your parents, you must have to be able to talk with your parents, be honest with them, ask questions and share with them knowledge you learn. Encourage them to have this conversation with the doctor as well. They need to have as healthy of a life as possible….no smoking, lose weight, see the doctor regularly to manage blood pressure. To help your parent live a happier and healthier lifestyle, perhaps make sure the lighting is appropriate and purchase a device that enlarges the print for easier reading. Stay on top of the driving situation. If your parent becomes a risk to them self and to others, then you must have a conversation about limiting or ceasing their driving. Listen to Day 5 of the 30 Day Prep Plan for more tips on your parents and driving. Be aware of options for AMD—though there really is no cure for AMD, it can be managed. And there are resources to help you. Lions Club International provides low vision resource centers. There are also AMD awareness groups such as BrightFocus Foundation, Macular Degeneration Foundation and the National Eye Institute. So that’s Day 8. Join us for Day 9 as we go from the Eyes to the Ears. Thank you for listening to the Raising ‘Rents podcast. This was Episode 17. If you have any questions or feedback, please go to our website www.raisingrents.com and click on the “Contact” tab. You can also find the show notes and references to anything we talked about. Until we talk again, remember that our parents raised us, the least we can do is help raise them. Talk to you later.